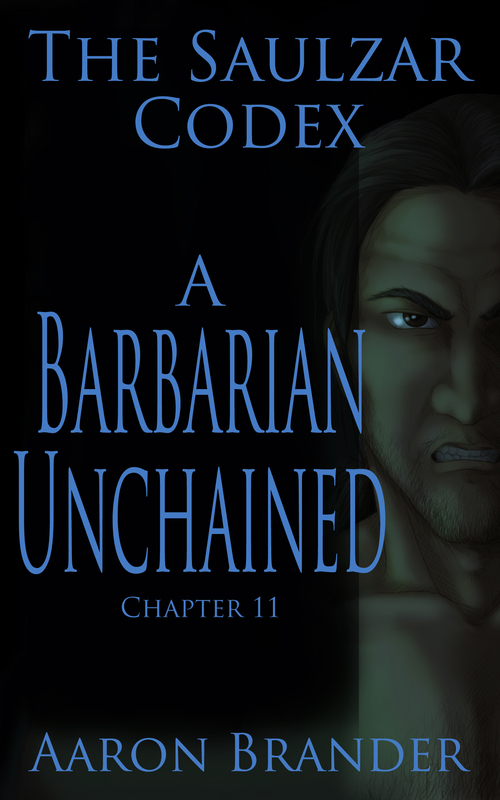 I’m happy to announce that A Barbarian Unchained is available! It is the eleventh chapter in the Saulzar Codex – a series of short stories focusing on Saulzar, a fierce warrior battling to overcome his own past. You can learn more about the project here. I’d love for you to stop by and pick it up. It’s a short story at 8,000 words and is priced at $0.99. Full winter had come to the northern lands, and with it the blessed return of deep night. With a furtive glance along the quiet alley, he slipped from the hovel. He was dressed in layers of warm, faded clothing, a fox fur hat, and a large hood that cast his face in deeper shadow. In his right hand he clutched a knife, honed to a keen edge during his days of fretful healing. He slipped through the shadows, moving slowly as much for stealth as from months of forced inactivity. His left side and right thigh burned with a dull ache, but the pain fueled his efforts, an iron core his weakened body leaned upon. The wind carried voices to him, and torchlight could be seen around the market square. Townsfolk had returned to Budria not long after his betrayal. Their hustle and bustle filtered through the walls and ground to reach his hiding place. He cared nothing for them and wished only to be quit of their cursed city. Breathless minutes passed as he snuck through the city, avoiding its inhabitants until the wall loomed before him. He crouched in the doorway of a quiet, stone building in sight of the wall. His breath hitched at a sharp pain in his thigh, but he closed his eyes and willed it away. Saulzar turned to regard the shadowed face of his old master. He saw concern in his eyes. Omen Taru reached out a hand and grasped at Saulzar’s shoulder, but he shook it off and stood. His eyes ranged the ramparts and noted the sentries before he crossed the dark road to the wall. He pocketed his knife, grasped a stone, noted the absence of ice that made his assault so difficult before, and hauled himself up. The climb was simple, but for the pain in his stiff shoulder.